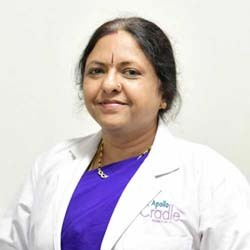 Dr. Saraswathi Ramesh is an Obstetrician and Gynecologist in in Apollo cradle Jayanagar 5th Block, Bangalore and has an experience of 30 years in these fields. She completed MBBS from Command Hospital Air Force, Bangalore in 1987, MD – Obstetrics & Gynaecology from Command Hospital Air Force, Bangalore in 1994 and Fellowship in Laparoscopy from Command Hospital Air Force, Bangalore in 1996. She does all kind of gynae laparoscopic surgeries and high-risk deliveries. I was admitted to Apollo Cradle under the care of Dr Saraswathi Ramesh for my delivery. Dr Ramesh is extremely helpful and punctual as well. There were no procedural or administration delays. The entire hospital functioned smoothly and maximum decorum was maintained. The nurses are professional and always working hard. The premises were clean; the doctors were always available on time. Great service by Apollo Cradle. I delivered my baby at Apollo Cradle Jayanagar. Thanks to my doctor and entire team; very professional and friendly staff. I delivered my baby at Apollo Cradle Jayanagar. Special thanks to Ms. Remya, Ms. Amrutha & M.s Jeevitha – Nurses who were excellent and my Dr. who took care of me. THANK YOU Cradle Maternity Hospital, Jayanagar for excellent care during my delivery and stay. My doctor Also took care of me very well your level of care and service really stands out. My doctor was Dr. Saraswathi Ramesh at Apollo Cradle, Jayanagar. Our experience with team cradle was enjoyable, we enjoyed every moment of our stay. Thank you. Thanks to @ Apollo Cradle everything was fine.